It’s easy to be complacent about security because you’re located in an area which doesn’t have a high crime rate or you don’t have a valuable inventory. While it’s true that location can play a part in the level of security needed, it’s fair to say that any personal residence or commercial building is vulnerable. You may prefer not to have front facing uniformed security guards on your premises, but in order to protect your family and employees, what other solution is there? The answer – a security concierge. 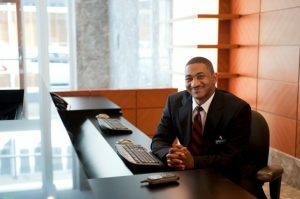 MA Security’s concierge program is tailored to the exact requirements of each client. Our guards can wear your company uniform and man the front reception desk, meeting visitors and directing them to where they need to be. Because they’re trained in security, they are the perfect fit for a busy entrance hall since they will be able to spot and identify anyone acting suspiciously and challenge their reason for being there, in a professional and friendly manner. They’ll be able to diffuse any threatening behaviour simply be remaining calm and keeping a cool head. They can also carry out other duties such as conducting a tour of the building last thing at night, to ensure that all doors and windows are closed, and that alarm systems have been set. Since concierge guards are providing both reception and guarding services simultaneously, this does away with having to pay two salaries, and in the event of sickness or holiday, we will ensure that you have replacementy concierge security in place. Their presence gives a sense of security to residents, visitors, and those working in the building. Imagine not just the benefits of anyone entering your building being greeted by a friendly, informative, and helpful concierge or doorman but of knowing that he or she is trained in all manner of security issues. This all in one solution will give peace of mind to anyone entering your building and enhance your company’s reputation. If you’d like to find out more about concierge security then give MA Security a call on 1300 020 406 and we can discuss how we can help you. With many years in the industry, we’re the security experts you can rely on.